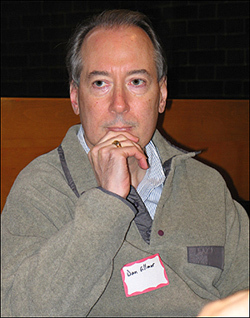 What's Next for Dan Gillmor? 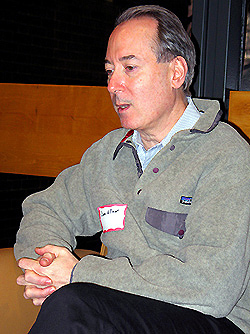 Dan Gillmor spoke with OhmyNews during the Berkman Center Internet and Society Conference in Cambridge MA, on Dec. 11. Dan Gillmor's announcement that he will leave the San Jose Mercury News next month in order to start a citizen-journalism venture has left many insiders scratching their heads. Why is this famous tech writer leaving what he described as "greatest gig in the world" for the perilous journey of developing an entrepreneurial idea in citizen-journalism? It is, in part, because it is there. Gillmor, a well-respected veteran journalist of 25 years, wrote in his blog on Dec. 10: "I hate the idea of leaving (the newspaper). But I'd hate not trying this even more." "I hope to pull together something useful that helps enable -- and demonstrates -- the emerging grassroots journalism that I wrote about in my recent book (We The Media, 2004). Something powerful is happening, it's in the early stages and I have a chance to help figure this out," he continued. 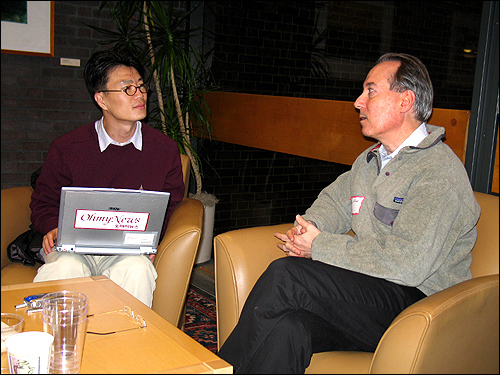 Gillmor sat down with OhmyNews in an exclusive interview at Harvard Law School in the middle of the final day of the College's Berkman Center-sponsored 2004 Internet and Society Conference on Dec. 11. OhmyNews: OK, let's get straight to it: What's your media venture all about? Dan Gillmor: That's what we're figuring out (laughter). I'm not saying this to be evasive, but it's so early that I just don't have the specifics in place. But I do know that I want to avoid "left vs. right" and I do hope to work on something that involves our economic system and how we can work out some of the problems we have. But it just feels to me like it's a trap to get into a leftwing-rightwing debate right now. There are lots of people already doing that quite well, and I also want to bring, as (OhmyNews) did, the understanding that professional journalists have actually learned a few things over the years -- things that actually work and we shouldn't just throw out those things that work as we go into this new era of citizen journalism. We should apply the best lessons from professional journalism -- which is not to say replicate it - but to combine the best of the old with that wonderful energy and excitement out there in the grassroots. I think that would be wonderful if I could pull that off. How do you feel about changing your career? I'm both excited and terrified (laughter) and a little bit sad, because I'm leaving a wonderful, wonderful job, working with terrific people whom I trust and admire and respect. And I'm stepping out of a business that I love. I love newspapers. But I hope that whatever we do is something that at some level newspapers can use, once newspapers decide to take the step that I think is necessary -- which is to be part of this new world. I'm hoping we will have created something that they can say "Well, we can do stuff like that too." That's my goal, to do something that is useful not just for old media but for all of us. I'm getting into it late compared to you -- I've said this to many people that OhmyNews is one of the things that inspired me both to write my book and now to make this move. It's certainly less of a risk for me than it was for you. 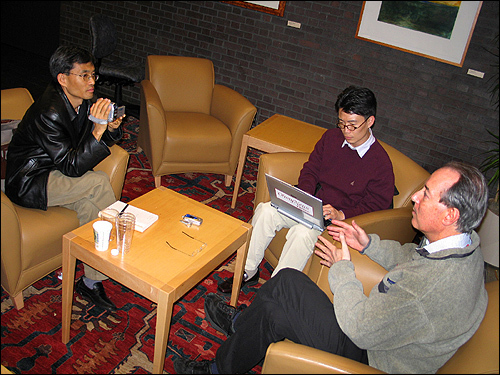 OhmyNews founder Oh Yeon Ho (left) and Jean K. Min interviewed Gillmor at Harvard Law School, Saturday. It's nice to get emails saying "Oh it's great that you're doing it," but when I get emails saying it's "courageous to do it" -- no, that's not courageous. Courage is what those Iraqi bloggers (participating in the Berkman Center Internet and Society Conference) are doing. It's what Hoder (Iranian blogger Hossein Derakhshan) is doing. It's what you did when you started OhmyNews. It's the soldier in Iraq who's putting his life on the line. It's the journalists in the Philippines who are getting assassinated at horrible rates. It's the guy in China who gets thrown in jail for telling the truth. That's courage. What message are you sending by starting your own media venture? I'm not trying to send a message. I feel I have a great opportunity to be part of something that is changing journalism and I want to be part of that. I heard your remarks yesterday at the conference. It seems your anger against the mainstream media was a part of the reason you took this direction in journalism. I don't want that to be the impression that people take away (from the conference). I still love newspapers and I work with wonderful people and have enormous respect for the institution of journalism that I've been part of for a long time. But I do think that election coverage, in particular, was not our best hour. Mainstream journalism should have done a better job as we should have done with other things. But we still do a better job at important journalism in broadcasting and reporting that so far we don't see done by the online community. Do many Americans share your anger, if I can call it that, against the mainstream media? I don't know the exact numbers, but polling suggests people are hoping for better things. How will you convince Americans of the need for your new venture? The opportunity now to go out and find things that you care about -- this has never been greater. Society as a whole needs to be more curious. And to go out and find things that they didn't know before and especially read things that they know they're going to disagree with, so that they can learn what the other side thinks and believes. We don't do that. But how do we learn if we don't ask people if we're wrong? So the "echo chamber" part really worries me -- when people seek out things they know they'll already agree with. That's deadly. Interestingly, the Republicans have traditionally been angry about what they call the "liberal-dominated" media. And they found their own alternative in the form of radio talk shows to bash liberal media. Isn't anger the reason they are launching their own alternative media like radio? One of the great things about the democratization of media is that people can do their own projects. Certainly people on the right felt that mainstream media was controlled by the left -- which I disagree with -- but that's how they felt. They have every right to build an audience and that's what they did, they built an audience. So we're just going even further with the grassroots kinds of things. Blogs are almost a descendent of talk radio, in a sense. Part of the reason of OhmyNews' success is there has been huge anger against the conservative-dominated media in Korea. Ironically this is what happened in the U.S., too, with the success of conservative talk radio reviling "liberal-dominated" media. So, like OhmyNews, can you tap into that negative energy prevalent among the democrats for your own citizen-journalism venture? I think one of the conditions that made OhmyNews possible and so successful are not the same ones as we have here. You really were going up against a monolithic media that was very heavily controlled newspaper system of three major papers that had the vast majority of readers and which were tied closely with the government. There is a much more diverse media in the U.S. than that today. So it's a different condition. But now we have this new possibility of doing all kinds of experiments with what you already understand so well -- which is that people out at the edge of the networks have a lot to contribute and that's what is going to be so much fun. Why did you decide to start your citizen-journalism project after the U.S. presidential election, rather than before? A number of reasons. And actually, I didn't get really serious about this until mid-summer thinking about what was possible. It was clear to me that trying to do this before the election would be a mistake, for several reasons. One was that people have a limited amount of attention or time to worry about things. It's like oxygen, there's only so much of it in the room, and all of the oxygen was going to the election and that it would be very hard to get into the middle of that. Second of all, what would you do after the election was over, if that's all you carried? I have interests beyond politics and I don't want to be creating something that is partisan. I think there is a giant group in the middle of American politics that knows that things are really wrong in many ways but they don't like the completely polarized left vs. right that was created during the last few years. The doctrinaire left cannot see things beyond politics from 40 years ago and still isn't sure about empowering business, for example. I'm not anti-capitalism, I'm pro-capitalism and I get a feeling from a lot of folks on the left that at some level there is some anti-capitalism going on there. And I don't want that to be what guides me. And on the right there is this authoritarianism, though they understand better how business works -- so we need to get the best of what both sides have and find solutions. But I don't know where we take it. In your opinion, what is the difference between OhmyNews and blogs in America? There are so many differences. The top difference is that your publication takes responsibility for what it publishes. The closer to the top of the page an article gets, the more editing I know you do. And you are a publication that (citizen reporters) can be a part of. But bloggers are individuals, scattered around the world and most have no editing at all. Blogging is a very individualistic medium. From the people I talked to when I visited Korea that were contributing to your publication, it was clear that part of the reason why they did it was to be part of OhmyNews. I think bloggers just want to be who they are rather than part of something else. So if the American bloggers make an alliance, they will become more powerful. But why don't they? Why don't the bloggers create their own version of OhmyNews? There are alliances among bloggers, but they are informal and they are based more on linking than on any arrangement. People sort of start to agree on something or want to point to something. And that's actually quite powerful. When that happens in a major way, you see things change quickly. As far as I know, there was no formal or even largely informal decision on the part of many people who started getting furious with CBS news for the (Bush national guard documents) story that they broadcast. But there were a lot of people who agreed with each other that this needed to be investigated and there was a lot that happened -- without a lot of phone calls. It wasn't a top-down decision, it was a bottom-up decision, and that's very powerful. So I do think that there is a room for a business or collective of bloggers who say, "Well, we want to cover the world our way so come to our page where we are all allied together" -- I haven't seen that happen yet, but I don't know why it wouldn't. There is some sense that the blogosphere in the U.S. is vastly liberal, as with Korea. Do you think that the Internet as a medium inherently favors certain political spectrums? No. It's a tool. It favors the people who are literal -- who can express their opinions succinctly and powerfully. The most successful early bloggers were conservatives, not liberals, in America. Or libertarian, depending on how you want to define people. But the most successful blogs that emerged after 9/11 were more conservative -- what became known as the war blogs -- and while there are some very successful liberal Weblogs around, but I don't think that they are as large in number as the conservative. But there are conversations in both -- there's room for everyone. Your comparison of journalism-as-a-lecture model vs. journalism-as-conversation is fascinating. How would you like to implement this in your new media startup? What I've been doing personally on the blog for some time now has been all about that. The only way you can have a conversation is if you listen. That's the first rule of conversation. And I've had a wonderful time listening, even when they attack me (laughter). I typically learn more from those who think I'm wrong than from people who think I'm right. Especially when they tell me why I'm wrong. And then once you learn how to listen -- which is something journalists need to do better -- then we can say that with the tools being created -- things like what OhmyNews is doing -- then we can say "Don't just respond to us but let's all talk together" and "Let's develop ways of taking that publication of a story and broadcast and make that the beginning of something." OhmyNews has sometimes been attacked on the issue of the accuracy of citizen journalism. How would you address that issue? I think people who want to do journalism have some responsibility to be accurate and if they're not, they run the risk of being ignored. I think the best thing to do with inaccurate journalists is to not pay any attention to them. But there's also now more responsibility on the part of the reader to be somewhat more skeptical about what they read. If I read something from someone I don't have any knowledge of, I don't assume that it's true. If it's based on something I'm going to make a major decision about, I'm going to check first. I have to. So I think it's going to be a little more work, but in the world of online journalism, we actually have to pay attention to what the other one is saying and when we see something that is wrong, we need to tell them. We need to regulate each other. I don't want the government to be responsible for that, I want the citizens, journalists and readers to be responsible. Wikipedia is experimenting with a news service called Wikinews that's based on massively distributed story contribution and fact checking. So, theoretically, there would be no worry about objectivity. Do you think that can be a viable model for online journalism? I'm on record as being a little skeptical of Wikinews, but not because I am skeptical of anybody involved in Wikipedia. I think they're geniuses and doing wonderful stuff. And I'm going to watch it carefully. I think there are things about it that are very much applicable to things that I'm going to try to do. But I think they have a lot to work out on how news applies to Wikis -- it's just not clear that it is a natural medium for news. Certainly for breaking news I don't think that Wikinews would be the place to go. But I expect that they're going to come up with some things that we can't anticipate now because they have so many people to work on it. I was also skeptical of Wikipedia when I first heard about it. But I think they've silenced most of my doubts and I'm in awe of what they've accomplished. There are lots of news media in the U.S., but the problem is they are mostly owned by a handful of people and organizations. Do you have any concerns about this concentration of media power? Most people get most of their information from very few companies, that's true. That's a problem and I think that people on both the right and left of the political spectrum know that that's a problem. At the same time there's this great potential of this medium to fix that problem if people start seeking out more things themselves. I have to point out again the case of talk radio, where people thought that media was not providing a crucial piece of news and so they said, "Ok, we'll do it ourselves." Whether one agrees politically or not, I think it's terrific that people do this. Take responsibility to teach each other what's important instead of waiting for the evening news to inform us. That's the beauty of this technology -- that we can talk to each other. There is a fear that people are only turning to the news they like and that on the Internet there is a balkanization of news. Do you think that the massively distributed model like OhmyNews can solve this problem? As I said, I am worried about this "echo chamber" where we only listen to what we want to. It's so important for people to expose themselves to things that are different. One of the things that I think is valuable about a newspaper is to be exposed to things you didn't know you cared about, especially if it covers a broad range of issues. But the tools are coming along that help people find other things. And I think that even a site or publication or whatever medium we're going to use, that even when it has a stance or political worldview, part of the fairness is in saying "If you disagree, we're going to make sure that your response is going to be prominently displayed near the original." And I think that covers what we need to do as well, as journalists, listening to the other side and giving displays for the opposing views. So Internet journalism, based on citizen journalism, can reduce that danger? It can. But it's not up to us. We can advise people to read other things and to look at other avenues. We can't force anybody to do that. But I think we as journalists have a responsibility to urge people to go beyond the page they're on. And yeah, part of what is so cool about the Web is the hyperlink -- the elemental unit of the Web. It tells you either here's something that backs up what I'm saying, or here's a way to get to something that is related to it. The Web is about links. What do you think about the future of the newspaper? Will it disappear? Well, eventually, sure. I assume that we will have electronic displays that will be very high resolution, without flicker, to replicate the very best of the page, of print, which is really a wonderful form factor. I love books and like magazines, I like newspapers. We're going to get eventually a kind of handheld thing that is easy and pleasant to read as paper is in our hands today -- with a lot of things that will make it better, in some ways. And of course there's the bathroom test -- can you take it with you into the bathroom. But I assume this will be solved. I'll probably always buy books, just because I'm old, but what's important is the medium as much as what's said. A lot of where we're going is kids today using video and audio in ways we could never contemplate -- and SMS is a media of its own -- so we have a lot to learn. Us old guys are learning a lot from younger people about it works. I've heard that your book will be published in South Korea soon. That's what I've been told. They sold the rights. I'll be writing a new introduction for the Korean audience. And I'm thrilled that this is happening. Of all the societies on the planet, yours may be the best to understand this, given partly because of what (OhmyNews did). What would you say to the Korean readers of your book? Do you have a final message for OhmyNews readers? Keep reading and keep contributing, and for your readers who are more on the side of the conservative. Start their own. Do an OhmyNews of your own so the conversation expands. But talk to each other and listen to each other. That's the real message.